Follow us on Twitter! Check us out on Facebook! This California native is a compact evergreen subshrub that grows 12' tall and 12-15" wide. It has soft grey-green foliage with a wonderful minty aroma. Showy heads of lavender-pink to purple flowers bloom from late spring to early summer. There are several species of Monardella that are native to California. Monardella villosa - coyote mint - is probably the one most commonly found in nurseries selling native plants. All the monardellas have refreshingly aromatic foliage, are relatively low-growing and are excellent providers of pollen and nectar for a wide variety of pollinators and beneficial insects. Coyote mint is native to California where it's found in many plant communities below 4,000 feet from Humboldt County south to Santa Barbara County and in the Sierra Nevada foothills. It's often seen growing with buckwheats (Eriogonum species), woolly yarrow (Eriophyllum lanatum) and silver bush lupine (Lupinus albifrons). 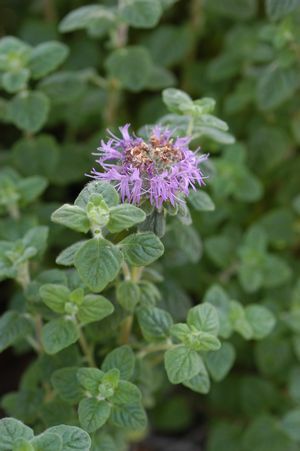 Coyote mint is a long-lived evergreen perennial or, more correctly, a subshrub. A subshrub is a herbaceous plant that develops a woody base. In the garden, coyote mint typically grows to around 12-15" tall and 15-18" wide. Occasionally, it can reach 2' tall. 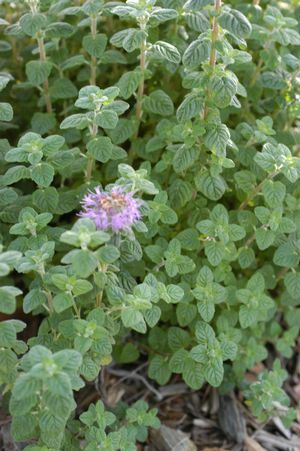 It forms a loose mound of highly aromatic minty leaves that are slightly oval in shape and a soft gray-green in color. It produces dense heads of showy lavender-pink flowers that put on a colorful show from late spring through mid-summer. On the coast, plants will often continue blooming, though less heavily, all summer long. On the coast, coyote mint can be grown in full sun where it can look good year round. It's also very happy in light shade. 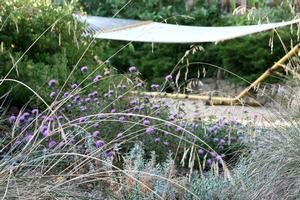 Inland, in hotter areas, it can look a little ragged in the dry summer and fall months. Therefore, it tends to look better when planted in a spot that doesn't receive full-on afternoon sun in the summer. Drought-stressed plants, both on the coast and inland, will lose many of their leaves. However, they will start to leaf out again fairly quickly in response to cooler temperatures and rain. Coyote mint's not particularly fussy about soil type, but it does need good drainage. If you're gardening in an area with heavy clay, then coyote mint will be fine if the ground slopes and water doesn't collect around the roots. On level ground, you may want to consider creating planting mounds. Once established, plants will survive with no summer water. They will, however, start to look a little straggly by the end of summer as they lose many of their leaves in response to droughty conditions. An occasional deep watering, if possible, will keep plants looking greener and encourage a longer blooming season. Remember that infrequent deep waterings encourage plant roots to go deeper in search of water. This helps make them more drought tolerant. Frequent shallow watering just encourages roots to stay in the top few inches of soil and plants will be much less able to survive periods of drought. During the blooming season, deadheading (cutting off flowers that have finished blooming) encourages plants to produce more flowers and bloom for longer. Don't deadhead though if you're wanting to collect seed from your plants or if you're wanting to leave the seed on the plants as a food source for seed-eating birds. Every year, cut plants back by about 1/3rd of their height in the fall or winter. This encourages them to stay full and dense. If you don't do this, plants tend to become sprawling and straggly after a couple of years.